The biggest need facing the Tampa Bay Lightning this off-season is without a doubt, an upgrade in the goaltending department. Most of the press has linked them with Roberto Luongo, the woebegone superstar seemingly headed out of Vancouver on a one-way ticket. However, it is not a foregone conclusion that the Quebec-native will be donning the #1 sweater in Tampa next season. With at least one other team (Toronto) in serious competition for his services, General Manager Steve Yzerman has to be diligently exploring other options. So what options are available to him? In exploring other team’s rosters and free agents, a case can be made that there are 13-15 players that could fill the #1 goaltender role for the Lightning next season. The list comprises a mix of veterans at the end of their contracts, youngsters trapped behind established starters, and a few dark horses sprinkled in as well. Below, in no particular order, are 10 players that Mr. Yzerman could potentially introduce as the newest member of the organization this summer. Roberto Luongo – Under contract through 2021-22 at $5.3 million. Luongo has been discussed at length. He’s led his team to the Stanley Cup finals, and backstopped a Presidents’ Trophy-winning squad. However, he has a long, expensive contract. Tim Thomas – Under contract through 2012-13 at $5.0 million. His name has come up more and more recently. Boston believes they have a capable replacement in Tuukka Rask, and some think that Thomas’ off-ice antics have soured management on him. Bringing him in with just one year left on his contract, and having Dustin Tokarski serve as his back-up for a full year, would upgrade the goaltending without having to commit to a long-term contract. Tomas Vokoun – Unrestricted free agent with a cap hit of $1.5 million in 2011-12. Vokoun had a solid year with the Capitals before being usurped by rookie Braden Holtby at the end of the season. If he’d be willing to sign a deal similar to his 2011-12 one, he could be a solid, short-term transition to Tokarski. Jonathan Bernier – Under contract through 2012-13 at $1.25 million. There were some rumors at the trade deadline that the Lightning were interested in him. With Corey Schneider seemingly off the market, the 23-year-old Bernier is one of the hottest prospects for teams needing help in net. Of course, his popularity among GM’s would also drive up the cost to acquire him. With so many options out there Mr. Yzerman might not be willing to sacrifice the assets needed to bring him aboard. Anders Lindback – Restricted free agent with a cap hit of $875,000 in 2011-12. A player whose name hasn’t come up as often as it should, probably due to the fact that he plays in Nashville, the Swede has posted decent numbers (2.53 GAA and a .914 SP%) while serving as Pekka Rinne’s backup. With Nashville possibly losing Ryan Suter to free agency, perhaps they could be talked into a deal for one of the Lightning’s young defensemen. Sergei Bobrovsky – Under contract through 2012-13 at $1.75 million. After posting strong numbers in his rookie season of 2010-11, Bobrovsky was shunted off to the side when Philadelphia signed Ilya Bryzgalov to a huge contract the following summer. The young Russian’s numbers were down this season as he struggled in the backup role, but at 23 he could be a long-term solution for the Lightning. Unfortunately, the two teams don’t match up well when it comes to trading (probably due to all of the recent deals they’ve already consummated). If the Flyers were willing to take a package of draft picks and a prospect, a deal might be possible as it would free up some cap space for them. Josh Harding – Unrestricted free agent with a cap hit of $750,000 in 2011-12. After spending the last four seasons backing up Niklas Backstrom in Minnesota, Harding could be the hottest name on the free agent market this summer. Throughout his career he has posted a .918 save percentage while allowing only 2.42 goals per game. There could be some question as to if he is a product of Minnesota’s defensive system, or if he can carry a team as a starter. The Lightning would face tough competition for his services from Toronto, Columbus, and possibly New Jersey. Jonas Gustavsson – Unrestricted free agent with a cap hit of $1.35 million in 2011-12. The “Monster” has worn out his welcome in Toronto it appears. 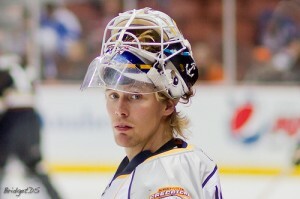 Even if the Maple Leafs don’t trade for Luongo, the 27-year-old Swede is set to hit the free agent market this summer. While his career numbers don’t place him among the elite, a change of scenery, especially to a smaller market, might benefit the big goaltender. Corey Crawford – Under contract through 2013-14 at $2.67 million. Despite posting better than average numbers as the starter in Chicago, the 27-year-old Crawford isn’t considered an indispensable part in the Windy City. The ‘Hawks have Ray Emery under contract for another year, and prospect Alexander Salak is waiting in the wings in Rockford. With offensive depth a concern in Chicago, the Lightning might be able to dangle Ryan Malone or Tom Pyatt and a 2nd round pick in trade talks. Martin Brodeur – Unrestricted free agent with a cap hit of $5.2 million in 2011-12. While at first glance this might seem inconceivable, it wouldn’t necessarily be impossible. Depending on how far the Devils make it in the playoffs this season, the future hall-of-famer may feel that he has one or two good years left in him. The cash-strapped Devils might be looking to go in a different direction in the off-season, and the Lightning could offer him a solid chance at one more Stanley Cup run. It is obvious that Mr. Yzerman has plenty of options to fill the opening in net. While Luongo might be the most attractive name on the market, it doesn’t mean he is the best fit, especially if Vancouver drags out the process trying to find the best possible trade partner. Who knows, in their mind they might be more than willing to stay in-house and go with a tandem of Mathieu Garon and Dustin Tokarski. The money saved could be used to bolster the team in front of the net. This summer storyline won’t resolve itself quickly, but Lightning fans can be assured that the organization will do their best to resolve it correctly.